Batman is among the most iconic superheroes of our culture. Yet his "power" is borne of a lifetime of hard work. Similarly, Green Arrow is just a world-class archer with really good gear, and Guardian, leader of Alpha Flight, was merely a genius scientist who invented high-tech battle armor. By contrast, Dante from the Devil May Cry games has a wide assortment of abilities beyond the reach of mere humans, yet he's perceived as a bounty hunter, not a superhero. Likewise, many of the characters in the Mortal Kombat franchise can teleport or fire bursts of energy, but few players would consider any of them superheroes. 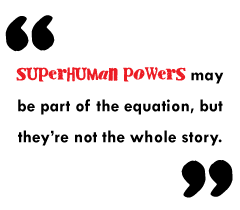 Superhuman powers may be part of the equation, but they're not the whole story. Then there's the matter of secret identities. Superheroes need a second identity in order to make their way through the drudgery of daily life and to protect their loved ones from those who would do them harm. Bruce Wayne, Clark Kent, Peter Parker and Scott Summers all must exist so their super-selves can be effective. On the other hand, Sol Badguy of the Guilty Gear games lives under an assumed identity using any means to keep his true name, Frederick, unknown; but he is just a wandering swordsman, isn't he? Of course, superheroes also operate beyond the law. National boundaries and extradition treaties mean little to Wonder Woman, and the illegality of vigilante justice doesn't deter the masked crime fighters who stalk the streets of Gotham, Metropolis or any of the other incarnations of New York City. To a superhero, justice trumps mere law. At the same time, there are abundant examples of super-teams organized, funded and mandated by their national governments, like Alpha Flight or S.H.I.E.L.D. Far from operating above the law, they're an extension of the legal system itself. We must also consider the apparel befitting a superhero. As a whole, superhero costumes have been fairly consistent in appearance throughout their history. The brightly colored, tight-fitting, logo-adorned format has few exceptions. Even characters who wear comparatively dull clothing tend to have something that sets them apart. Rorschach of The Watchmen wears the gumshoe-standard trench coat and fedora, but accents them with a frightening, ever-changing inkblot mask. Yet it isn't the costume that makes the superhero; anyone can put on tights and a mask. This has been amply evidenced by the regular membership drives for the Legion of Super-Heroes, and the associated high washout rate. (Arm Fall Off Boy, I'm looking at you.) In the end, the costume may be just a bit of shorthand to more clearly mark them as apart from the rest of society. It also makes a convenient bit of sleight-of-hand to keep the general public ignorant of any civilian identities that may need hiding.